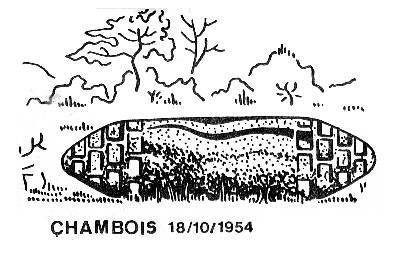 Reference number for this case: 18-oct-54-Chambois. Thank you for including this reference number in any correspondence with me regarding this case. Aimé Michel indicates that on October 18, 1954, at 05:30 P.M., Mr. Bachelard, aged 42, was driving by van between Gelles and Coheix in the Puy-de-Dome, under a clear weather, without fog and with a still sharp sun. At 6 kilometers of Coheix, while coming out of a turn in the road, he felt half paralyzed, and the engine of his van gave signs of failure. His speed fell to 30 kilometers per hour. He tried to accelerate, but in vain. At this time, he saw an elongated of flat object of ten meters length on 2 meters 50 height in a nearby field. The object was motionless, silent, and did not have port-holes. Mr. Bachelard arrived at Coheix a few minutes later and told of his experience. People noticed that he was still shaking. The gendarmes were informed and interrogated him. One went on the spot but nothing abnormal was found. The gendarmes told him that these machines seemed "to have a soft spot for the area," probably because of the landings in Gelles and Cisternes-la-Forêt not far from there. The author indicates that on October 18, 1954 in the Puy-of-Dome, Mr. Bachelard in a car saw a dark saucer posed in a field close to the road. He felt half paralyzed, the engine was not fully working and speed fell to 30 km/h. The source is indicated as "M., II, p. 336". Richard Hall indicates that on October 18, 1954, in Coheix, the Puy-De-Dome, France, the driver of light truck felt half paralyzed, the motor began missing, a dark elongated object seen in nearby field. The Police later searched field and found nothing. Puy-de-Dôme France. October 1954 Paralysis. Truck engine gave trouble, slowed down to 20mph. Go no faster. 180 feet. In a "catalogue of effects" in the ufology magazine LDLN, Mr. and Mrs. Ameil give information on the case of "Gelles (Puy-de-Dôme)" indicating that the witness is Mr. Bachelard, pastoral guard in Gelles, that the case is well known and was reported by the majority of the regional and national newspapers of the time. They indicate that 14 years later, they heard the witness who seemed to them worthy of faith, to have a rather good memory, and having all his sanity. They indicate that on October 18 1954, the witness returned from Chanat and went towards Gelles. At the crossroads of Chambois, at the exit of a great turn, at the edge of a forest, he saw a "cistern" a few meters from the road. The engine of his car had "failures" and great turning difficulties. Approaching the "cistern" in his car, he became frightened and felt like hypnotized and even half-paralyzed, and did not seem to be master of his vehicle anymore. He found himself in Coheix without knowing how nor why, this locality not being on his way. Farmers of Coheix see him arriving with "a pale and decomposed face". Alerted by the witness, these people go on the spot one hour later armed of several tools, find neither the "cistern" nor any trace of its passage. There were tall grasses more or less lying because of the wind. "I realized thereafter that it was not exactly a cistern for it had the two ends pointed like a large cigar. It was of chestnut chocolate color and showed drawings in the shape of rectangles which seemed to square its two ends. It might have been 10 meters long by 2.50 meters in height approximately. I did not hear any noise coming from the craft but only felt this indescribable fear." The authors add that the witness is not of timorous nature but however during several weakd he feared to leave in the evening and especially to pass in the surroundings of the observation spot. They add that there is no "orthotenic line" passing by this place but it is within 8 kilometers of the Baillonne-Vichy line, that there are do not have there faults or geological fracture within less than 3 km 200, that the ground is composed of trachybasalte, andesite and several kinds of gneiss. This is one of a series of further investigations of landings during the great wave of 1954. The re-investigation was carried out by M. and Mme. Ameil for Lumières dans la Nuit. Our article is a translation, by Gordon Creighton, of the report that appeared in LDLN No. 97 of December 1968 (address; M. R. Veillith, "Les Pins", 43-Le-Chambon-sur-Ligon, France). THIS incident took place at Gelles (Puy-de-Dome, South-Central France) on the evening of October 18, 1954. The case is a well-known one, and was reported by most of the regional and national newspapers of France. Aimé Michel's account of it can be found on page 198 of Flying Saucers and the Straight Line Mystery (Criterion Books, New York. 1958), which is the English-language version of Mystérieux Objets Célestes. Although this case is now fourteen years old, the testimony given at the time by the witness, Monsieur Bachelard, a 42-year-old village policeman, retains all its full flavour, for we can certify that the witness appears to us to be trustworthy, in full possession of all his mental faculties, and to have, a good memory. Here follows our report on what he has just told us. On October 18, 1954, Monsieur Bachelard, village policeman, domiciled at Gelles (Puy-de-Dôme) was returning in a light van from Chanat to Gelles. Reaching the fork in the road that leads to Chambois, he takes a major turn on the edge of an area of woodland and sees a 'cistern', he is overcome by fear and suddenly feels as though semi-paralyzed, even "hypnotized"; he no longer seems to be in control of his vehicle. Moreover, the next thing he knows is that he is at Coheix, without knowing how or why. For Coheix does not lie on his homeward route. Some Coheix farmers see him approaching, "his face pale and drawn". Alerted by him, these people, armed with some farm tools, visit the scene of his strange encounter about an hour later, but they find neither the "extraordinary cistern" nor any clear trace of its having been there. The grass at the spot was long, but had been laid more or less flat by the wind. "I realised later that it wasn't precisely a cistern, for its two ends were pointed, like a big cigar. It was of a chocolate-brown colour and had rectangular markings which crisscrossed its two ends. It may well have been ten metres long and about 2.5 metres high. I heard no sound from the machine, but merely felt this indescribable fear." We might add that, although M. Bachelard is not or a nervous or timid nature, he was afraid to go out at night for several weeks afterwards, and especially afraid of going anywhere near the scene of his sighting. No clearly established line passes over the actual site. But it does lie right in the centre of, and only a few kilometres from, several lines that form a network. In particular, there is the BAYONNE~VICHY LINE, eight kilometres distant. The spot lies on no particular line of fractures or fault. The soil consists of trachybasalt, andesite, and several sorts of gneiss. A person from Vichy who came to visit M. Bachelard after the occurrence told him that he himself had had a somewhat similar experience. He said that as he had been driving along he had some engine trouble, until finally the engine stopped altogether as a "cigar" approached, flying silently at only the height of a man from the ground. The Ameils do not give any details about the time and duration of this experience, and in view of the witness's distraught and pale appearance when he turned up in Coheix - a place not on his scheduled route - one may at first be tempted to wonder whether this was not indeed another case of the Barney and Betty Hill type, and whether he may not have spent some considerable time in alien custody undergoing some sort of processing or examination. However, according to Aimé Michel (op. cit., p. 198), M. Bachelard saw the "cigar" or "cistern" at 5.30 p.m., and arrived in Coheix a few minutes later. It would seem therefore that his pallor was due simply to the tremendous fear engendered by what he had seen and not by any mysterious "contact" or "processing" that he had undergone, although we should bear in mind the possibility of "time warp" and "time manipulation". For these phenomena pertaining to the lapse of time there is much good evidence, so that for all we know M. Bachelard may have actually been in the custody of alien beings and have undergone some sort of "processing". As regards the mention of the "long grass laid flat by the wind", this at any rate sounds familiar enough to us. Did the farmers fail to perceive the evidence when it was there before their eyes? The two authors indicate that in Mazaye, in the department of the Puy-de-Dôme, on October 18, 1954, at 05:30 p.m., Mr. Bachelard, forest guard in Gelles in the Puy-de-Dome, was returning from Chanat in the direction of Gelles by car at the time of this very beautiful autumn evening, under a cloudless sky, with the sun still shining above the horizon. Arrived at the junction of Petit-Chambois, at the exit of a great turn in the edge of the forest, he saw what it initially thought of being a large cistern at a few meters of the road. At this time the engine of his car had "failures" and did not function well any more. Mr. Bachelard pressed on the accelerator pedal in vain. The speed of the car hen fell down to 30 km/h. As his vehicle was approaching the "cistern", Mr. Bachelard felt invaded by fear and felt suddenly "hypnotized" or paralyzed, and felt that he had lost control of his vehicle. "I realized thereafter that it was not exactly a cistern for it had two pointed ends, like a large cigar. It was of chestnut - chocolate color and had drawings in the shape of rectangles which seemed to square its two ends. It could have been 10 meters long on 2 meters 50 of height approximately. I did not hear any noise coming from the machine but only felt this indescribable fear." Without knowing how or why, he suddenly found himself in Coheix, which was not at all on the direction that he had intended to take. Farmers of Coheix saw him arriving with a pale and broken up face, obviously under the effect of an intense fright. He was still trembling when he told them of his strange experiment. The gendarmes are then alerted, and they come to hear his account. The gendarmes and some peasants then returned with him to the place of the encounter, armed with several tools. They arrived there approximately an hour later and find no cistern nor any particular trace. They note that there are tall grasses lying, but that could be very well explained as the result of wind action. During several weeks, Mr. Bachelard remained afraid to go outside after the fall of the night, and, especially, to go again at the location of his experience. At 6 km of Coheix, Mr. Bachelard felt paralysed and the speed of his truck fell down. He saw in a field a lengthened object (A.M. p. 241). The two authors indicate that close to Chambois, between Chanat-la-Mouteyre and Mazaye, at the location "Champille", Gaston Bachelard, 42-year-old, official forest guar from Gelles, returned from Chalat and moved towards Gelles. At the junction of Grand-Chambois, little before Champille, at the exit of a turn at the edge of a forest, he saw a kind of "cistern" posed on the ground. He described it as a cigar of chocolate brown color showing patterns in the shape of rectangles which seemed to square its ends. The dimensions are given as 2.50 meters in height and 10 meters in length. The object was a few meters from the road, and the witness vehicle engine had "failures" and also big difficulties to function. While approaching the craft the witness became afraid and suddenly felt like "paralyzed" or even "hypnotized." He did not seem to master his vehicle any more, and found himself without knowing why or how in Couhay, in the south of Mazaye, whereas this locality was not on his road. He did not remembered to have passed neither Mazaye nor Ceyssat on the D52 although he had to pass by one or the other of these villages to find himself in Couhay. Farmers of this village see him arriving "with a pale and broken face". They went on the spot one hour later armed with several tools, but saw neither the "cistern" nor any landing trace, at the landing site covered of high grass flattened by the wind. The authors note the proximity of two military camp and a weapons test range, and that Aimé Michel wrote Coheix instead of Couhay. The sources are indicated as a counter-investigation by Mr. and Mrs, Ameil, LDLN investigators, in LDLN #97, page 11; Aimé Michel in "A Propos des S.V." page 241; and Quincy. In his chapter on the cases of paralysis or drowsiness of UFO witnesses during their experience, Pierre Delval indicates 12 cases from the French flap of 1954, among those, that in Coheix in the department of the Puy-de-Dôme, on October 18, 1954 at 05:30 p.m..
Gaston Bachelard, aged 42, was driving on secondary road 52, between Chanat and Couhay. At the exit of a turn, he saw a "water tank" of 10 meters length and 2,50 meters diameter, posed at the edge of the road. His engine had failures, and when he approached the thing, he felt half paralyzed, like hypnotized. Oddly, whereas he was going to Gelles, he found himself without knowing how in Coheix, another locality, where he did not intend to go. Quite possibly the most important case of the great flap was the experience of a 42-year-old village policeman named Monsieur Bachelard. His "missing time" seems to validate sensational reports made decades later. If so, the implications are enormous. "I realised later that it wasn't precisely a cistern, for its two ends were pointed, like a cigar. It was of a chocolate-brown colour and had rectangular markings which criss-crossed its two ends. It may well have been ten meters long and about 2.5 meters high. I heard no sound from the machine, but merely felt this indescribable fear." 151. At that moment the van's engine started to misfire and steering became difficult. Shortly thereafter he began to have physical trouble, finding himself in a semi-paralyzed condition. Another word used in the account was "hypnotised." Here there is a puzzling gap in M. Bachelard's memory, a period of "missing time." The very next thing the policeman recalled was that he was entering the village of Coheix in his van, but why he had taken a road off his usual route and what had happened since his encounter with the "cigar," was a total blank. M. Bachelard immediately approached some Coheix farmers and tried to explain his situation. The peasants were impressed by the "pale and drawn" appearance of Bachelard and were convinced enough to shoulder their pitchforks and returned with the policeman to the site of the encounter ready to do battle if the need arose. There was no strange object at the spot when the men arrived but an hour had passed, giving the thing plenty of time to escape. Those who knew M. Bachelard described the fellow as a stable person, not the nervous or timid type, which is logical considering the man's occupation, yet the encounter had a powerful effect on the man. For a long time M. Bachelard was afraid to venture outdoors after dark and he refused to go anywhere near the area of his mysterious experience. 152. The author indicates that on October 18, 1954 in Chanat-la-Mouteyre and Mazaye in the Puy-de-Dôme, Gaston Bachelard drove by car on the D52, and little before the locality "Champille", he saw a kind of cigar or cistern of chocolate color posed a few meters of the road. His car engine coughed and had failures, then the witness felt half paralyzed or "hypnotized." He had the impression not to be master of his car anymore and found himself in Coheix, in the South of Mazaye, without knowing why nor how, since this locality is not on his normal way. Jean Sider notes that Figuet indicates "Couhay" whereas it is indeed Coheix according to the Michelin Atlas of 1996 in C2 on page 112. Sider indicates that the source is an investigation by Mr. and Mrs. Ameil in LDLN N.97 for December 1968, that he reproduces in appendix. He comments that there is a "missing time" since the witness has no memory of having crossed two localities before arriving in Coheix. "Report - October 18, 1954; Coheix, Puy-De-Dorne [Dôme], France. Driver of light truck felt half paralyzed, motor began missing; dark elongated object seen in nearby field." The Belgian ufologist indicates that in 1954, on October 16 or 18, in France, in Chambois (Puy de Dôme) at "17:30 forest guard Bachelard drives by van, it is still in daylight. When leaving a turn Mr. Bachelard feels a strange numbness, a kind of paralysis. At the same time the engine of the vehicle has failures and starts to fail. The speed falls to 30 km/h. At this point in time he sees in a field close to the road a large cigar with pointed ends, ten meters long, 2,50m high approximately, chestnut chocolate color with drawings in the shape of rectangle that seemed to square the ends. The object is motionless, silent, without light nor porthole. A few minutes later Mr. Bachelard, without knowing how, ends in Couhay, outside his normal road. Farmers see him arriving with a pale and broken face, obviously under the effect of an intense fright. During several weeks the witness does not dare to go out in the evening anymore nor to pass by at the same place again." The source for the above is indicated as "GARREAU and LAVIER: "Face aux extra-terrestres" - DELARGE 1975 - J'ai Lu, p. 199." "A Mazaye, at 17:30 Mr. Bachelard drove a van on the secondary road D 52 E between Chenat and Couhay, when suddenly the engine seemed to slow down and he felt paralyzed. He then saw in a field close to the road a brown object of approximately 10 m length and 2,5 m in height, silent, not emitting any light and without opening." The sources for the above are indicated as "Combat, La Croix, 20 oct 1954" et "Jacques Vallée: 'Chronique des apparitions ET' - DENOEL 1972 - J'AI LU COLL. - p. 283", with the date October 16. The Australian ufologist indicates that on 18 October 1954 at 17:30 in Auvergne, France, male witness Bachelard, aged 42, was driving a light truck on a clear, sunny day, suddenly felt himself to be half paralyzed. The vehicle slowed down by itself. In a nearby field was an elongated object 10m long, hovering 1.2m above the ground. He continued driving. The sources are indicated as Michel, A. 1958. Flying Saucers and the Straight Line Mystery. New York. Criterion Books. p198; and Rodeghier, M. 1981. UFO Reports Involving Vehicle Interference. CUFOS. Chicago. p3. Jean Sider indicates that the close encounters of the 1st, 2nd and 3rd kind can "camouflage an abduction". In support of this thesis he cites two cases in France including the October 18, 1954 case in Gelles, indicating that his short summary comes from the investigation by Mr. and Mrs. Ameil published in the Lumières Dans La Nuit magazine, and also as a more condensed version in his book about the 1954 flap in France. He indicates that restored in its broad outline, the case is that Gaston Bachelard, rural policeman in Gelles in the Puy-de-Dôme drove by car on the D.52 and that little before the location of Champille, he saw a large object in the shape of a cigar or cistern of chestnut color posed within a few meters of the road. The object has pointed ends, its size is estimated as 10 feet in length and 2.5 meters in height. The car's engine has failures and starts to cough, and the witness then felt half-paralyzed or hypnotized, having the feeling he was not the master of his car more, and he found himself in Coheix, in the south of Mazaye, on the D558, without knowing why nor how, because this locality is not on the way that he was to borrow. Witnesses saw him arriving pale and very shocked. One hour later, with several farmers, he returns where the "cistern" had been but it had disappeared. Jean Sider comments on that at the time one did not talk of "kidnapping and even less of abductions", the first case being that of the Hill husbands in 1961, and that the investigators, who carried out the investigation in 1968, thus could not suspect an abduction, and that one will never know whether the witness "recorded a missing time, neither if he was lifted with his car from the D.52 to be deposited on D.558, nor if he drove the vehicle there by himself, his mind under the control of a intelligence that was foreign to his." 1954 – At 5:30 p.m. in Mazaye, France Mr. Bachelard was driving a light truck on road D52E between Chanat and Couhay when suddenly the engine seemed to slow down and he felt "paralyzed." He then saw in a field near the road a brown object about 10 m long, 2. 5 m high. Silent, it gave off no light and showed no opening. (Sources: Aime Michel, Flying Saucers and the Straight Line Mystery, p. 198; Jacques Vallee, Passport to Magonia: A Century of Landings, p. 231). Luc Chastan indicates that in the Puy de Dômes [Dôme] in Mazaye on October 18, 1954 at 17:30 hours, "the witness, forest guard in Gelles in the Puy-de-Dôme returns from Chanat in direction of Gelles by car. It is a very beautiful autumn evening, a cloudless sky, the still sharp sun above the horizon. At the junction of Petit-Chambois, at the exit of a great turn in the edge of a forest, he sees what it would initially think to be a large cistern within a few meters of the road. At this time the engine of his car "has failures" and does not function well any more. Mr. Bachelard presses vainly on the accelerator. The speed falls to 30 km/h. His vehicle approaching the "cistern", Mr. Bachelard feels overwhelmed by fear and feels suddenly "hypnotized" or paralyzed, he feels he is no more the master of his vehicle." "He would state: 'I realized thereafter that it was not exactly a cistern for it had the two ends in a peak, like a large cigar. It was of chestnut chocolate color and presented drawings in the shape of rectangle that seemed to square its two ends. It could be 10 meters long well on two meters 50 top approximately. I did not hear any noise coming from the machine but only felt this indescribable fear.'" "He suddenly found himself in Coheix, without knowing how nor why for this place is not at all on the planned way. Farmers of Coheix would see home come with a pale and broken face, obviously under the effect of an intense fear. He still trembles. He tells his strange meeting. The gendarmes are alerted. They come to hear him. Then one returns on the spot armed with several tools, they arrive there approximately an hour later and find no cistern nor any particular trace. There are tall grasses, indeed lying but that is very well explained by the action of the wind." "This same day, testimonies were collected in Gelles and Cisternes-la-Forest, i.e. in a ray of a few kilometers around the landing place." "During several weeks, Mr. Bachelard was afraid to leave after night, and, especially, to pass again at the same place." The sources are indicated as "Face aux Extra terrestres by Garreau et Lavier ** DELARGE 1975" and "Chroniques des apparitions E.T. by Vallée Jacques ** DENOEL 1972 - J'AI L coll.". The website indicates that on 18 October 1954 at 17:30 in Gelles, France, "An object was observed. Electromagnetic and physiological effects were noted." "One brown cigar-shaped object, about 40 feet across, was observed in clear weather by one male 42-year-old witness (as reported to the police) on a highway for over one minute. No sound was heard." The sources are indicated as Michel, Aime, Flying Saucers and the Straight-Line Mystery, S. G. Phillips, New York, 1958; FSR, FSR Case Histories (v.1 to v.18 complete), FSR, London, 1970; Bowen, Charles, The Humanoids: FSR Special Edition No. 1, FSR, London, 1966; Vallee, Jacques, Computerized Catalog (N = 3073); Vallee, Jacques, Challenge to Science: The UFO Enigma, Henry Regnery, Chicago, 1966; Vallee, Jacques, Preliminary Catalog (N = 500), (in JVallee01); Vallee, Jacques, A Century of Landings (N = 923), (in JVallee04), Chicago, 1969; Cramp, Leonard G., Piece for a Jig-Saw, Somerton, Isle of Wight, 1966; Schoenherr, Luis, Computerized Catalog (N = 3173); Carrouges, Michel, Les Apparitions de Martiens, Fayard, Paris, 1963; Hall, Richard H., The UFO Evidence, NICAP, Washington, 1964; Flying Saucers, Flying Saucers Magazine, (Palmer); Bullard, Thomas E., UFO Abductions: The Measure of a Mystery. Volume 1: Comparative Study of Abduction Reports, FUFOR, Bloomington, 1987; Rodeghier, Mark, UFO Reports Involving Vehicle Interference, CUFOS, Chicago, 1981; Falla, Geoffrey, Vehicle Interference Project, BUFORA, London, 1979; Hatch, Larry, *U* computer database, Author, Redwood City, 2002. The website indicates that on 18 October 1954 in "Auvergne, France", "An object was observed. Physiological effects were noted. An unidentifiable object was observed at close range and caused physical effects." The source is indicated as "Hall, Richard H., The UFO Evidence, NICAP, Washington, 1964". The website indicates that on 16 October 1954 at 17:30 in Mazaye, France, "A brown object about ten meters long, 2.5 meters high" and "At 5:30 p.m. in Mazaye, France Mr. Bachelard was driving a light truck on road D52E between Chanat and Couhay when suddenly the engine seemed to slow down and he felt 'paralyzed. ' He then saw in a field near the road a brown object about 10 m long, 2. 5 m high. Silent, it gave off no light and showed no opening." And: "Mr. Bachelard was driving a light truck on road D52-E between Chanat and Couhay when suddenly the engine seemed to slow down and he felt "paralyzed." He then saw in a field near the road a brown object about ten meters long, 2.5 meters high. Silent, it gave off no light and showed no opening." And: "A hovering object was observed. One brown object was observed by several witnesses for 99 minutes." (141) Oct. 18, 1954 - Driving a van four miles from Coheix, Puy-de-Dome, France Mr. Bachelard, age 42, was going around a bend in the road at 5:30 p.m. when he felt half paralyzed and his van's motor began missing and slowed to 20 mph. He then saw hovering in a nearby field a motionless, silent elongated or flattened object 30 feet long. A police investigation was conducted. (Source: Aime Michel, Flying Saucers and the Straight Line Mystery, p. 198; Richard Hall, The UFO Evidence, p. 74; Mark Rodeghier, UFO Reports Involving Vehicle Interference, p. 3). *Oct. 16, 1954 – At 5:30 p.m. in Mazaye, France Mr. Bachelard was driving a light truck on road D52E between Chanat and Couhay when suddenly the engine seemed to slow down and he felt "paralyzed. " He then saw in a field near the road a brown object about 10 m long, 2. 5 m high. Silent, it gave off no light and showed no opening. (Sources: Aime Michel, Flying Saucers and the Straight Line Mystery, p. 198; Jacques Vallee, Passport to Magonia: A Century of Landings, p. 231). This database recorded this case 15 times! This is a drawing for the object in this case by artist and ufologist Jean Giraud. [---] Article in the national newspaper Combat, October 20, 1954. [---] Article in the national newspaper La Croix, October 20, 1954. [am1] "Mystérieux Objets Célestes", book by Aimé Michel, Arthaud publisher, France, page 335, 1958. [am1] "Flying Saucers and the Straight Line Mystery", book by Aimé Michel, English version of "Mystérieux Objets Célestes", S.G. Phillips publisher, France, page 198, 1958. [mc1] "Les Apparitions de Martiens", book by Michel Carrouges, aka Louis Couturier, Fayard publisher, France, page 128, 1963. [rh1] The UFO Evidence", book by Richard Hall, NICAP, USA, section 8, 1964. [---] "Piece for a Jigsaw", book by Leonard G. Cramp, Sometron Publishing Co piblishers, U-K., 1966. [am1] "Mystérieux Objets Célestes", book by Aimé Michel, Seghers publisher, France, page 265, 1969. [ld1] Re-investigation report by Mr. and Mrs Amiel in the ufology magazine Lumières Dans La Nuit (LDLN), France, #97, page 11, December 1968. 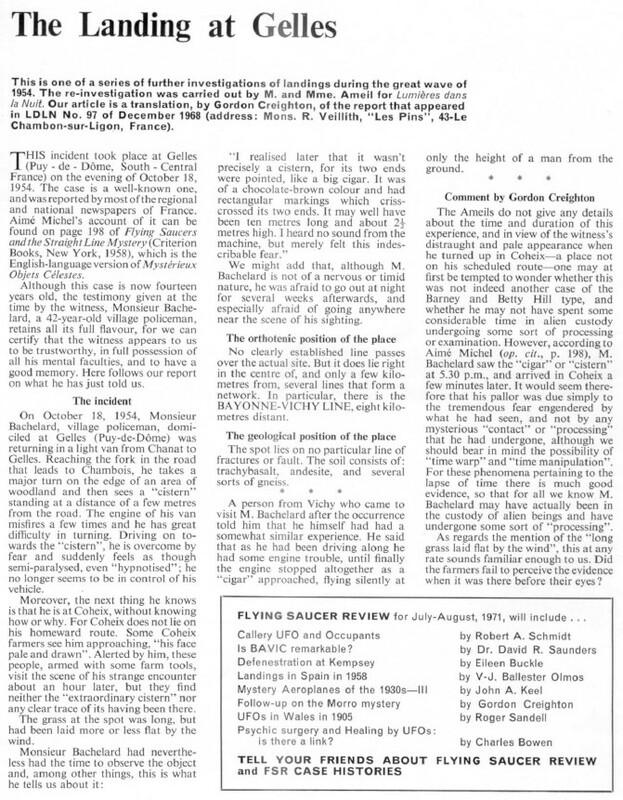 [fs1] "The Landing at Gelles", by Mr. and Mrs. Ameil, translated by Gordon Creighton, in the ufology magazine Flying Saucer Review (FSR), U-K., Supplement No. 5, page 3, June 1971. [gl1] "Face Aux Extra-Terrestres", book by Charles Garreau et Raymond Lavier, Jean-Pierre Delarge publisher, France, page 137, 1975. [ld2] "Les archives de 1954 pour le Puy-de-Dôme", in the ufology magazine Lumières Dans la Nuit (LDLN), France, #125, page 27, May 1973. [pd1] "Le Grand Livre des Objets Volants Non-Identifiés", book by Pierre Delval with the Oranos Committee, De Vecchi publisher, page 253, 1976. [---] Vehicle Interference Project", compiled by Geoffrey Falla, British UFO Research Association (BUFORA), U-K., 1979. [---] Computerized Catalog", compiled by Luis Schoenherr. [---] UFO Reports Involving Vehicle Interference", compiled by Mark Rodeghier, Center for UFO Studies (CUFOS), USA, page 3, 1981. [mf3] "ATTERRISSAGES D'UFO sur le continent français du 26 septembre 1954 au 18 octobre 1954", list by Michel Figuet in the ufology magazine Lumières Dans La Nuit (LDLN), France, #249-250, page 28, March / April 1985. [mf1] "Catalogue Francat des rencontres rapprochées en France (Listing 800 1982) (2 · Suite)", list compiled by Michel Figuet, in the ufology magazine Lumières Dans La Nuit (LDLN), France, #257-258, page 20, november - december 1985. [---] UFO Abductions: The Measure of a Mystery. Volume 1: Comparative Study of Abduction Reports", book by Thomas E. Bullard, Fund for UFO Research (FUFOR), USA, 1987. [lg1] "The Fifth Horseman of the Apocalypse - UFOs: A History - 1954 October", monography by Loren E. Gross, USA, pp 65-66, 1991. [js1] "Le Dossier 1954 et l'Imposture Rationaliste", book by Jean Sider, Ramuel publisher, France, page 260, 1997. [---] "UFOs and Anti-Gravity - Piece for a Jigsaw", book by Leonard G. Cramp, Adventures Unlimited Press publishers, U-K., pp 234-235, 1997. [js2] "UFO-Related Human Physiological Effects", by John F. Schuessler, in "Physical Evidence Related to UFO Reports, The Proceedings of a Workshop Held at the Pocantico Conference Center, Tarrytown, New York September 29 – October 4, 1997", published by the Journal of Scientific Exploration, 1997. [ni1] The NICAP Web Site. [am1] "A Propos des Soucoupes Volantes", book by Aimé Michel, reprint of "Mystérieux Objets Célestes", Planète publishers, France, page 241, 1976. [fr1] "OVNI - Premier Dossier Complet des Rencontres Rapprochées en France", book by Michel Figuet and Jean-Louis Ruchon, Alain Lefeuvre publisher, France, pp 185-186, 1979. [js3] "La Vie Vient d'Une Intelligence Supérieure", book by Jean Sider, JMG publisher, France, pp 212-215, 2002. [ad1] "Impact initiatique du phénomène OVNI", article par Anne Duflot, G.E.R.U. France, 2007. 1.0 Patrick Gross January 2, 2009 Conversion from HTML to XHTML Strict. First formal version. Additions [fr1], [js1], [go1], [ad1], [lc1], [ud1]. 1.1 Patrick Gross June 6, 2009 Additions [rh1], [fr1], [kb1], [dj1], [lc1], [ud2]. 1.2 Patrick Gross June 9, 2009 Addition [js3]. 1.3 Patrick Gross December 25, 2009 Addition [mc1]. 1.4 Patrick Gross December 29, 2009 Addition [ud3]. 1.7 Patrick Gross September 17, 2014 Additions [fs1], [ni1]. 1.8 Patrick Gross October 18, 2014 Additions [ni2]. 1.8 Patrick Gross December 15, 2016 Additions [lg1], [ub1]. 1.9 Patrick Gross January 14, 2019 Additions [ou1], [pr1], [mf3], [mf1], [lh1].